In Consuming Stories, Rebecca Peabody uses the work of contemporary American artist Kara Walker to investigate a range of popular storytelling traditions with roots in the nineteenth century and ramifications in the present. Focusing on a few key pieces that range from a wall-size installation to a reworked photocopy in an artist’s book and from a theater curtain to a monumental sculpture, Peabody explores a significant yet neglected aspect of Walker’s production: her commitment to examining narrative depictions of race, gender, power, and desire. 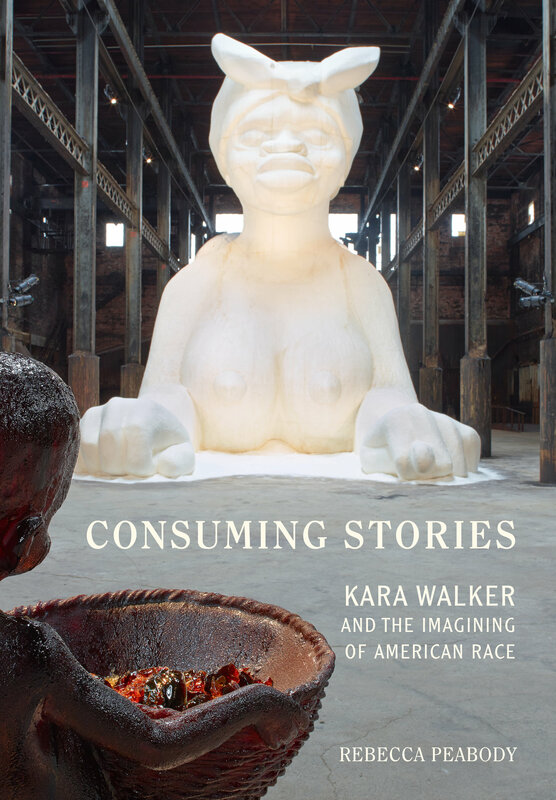 Consuming Stories considers Walker’s sustained visual engagement with literary genres such as the romance novel, the neo-slave narrative, and the fairy tale and with internationally known stories including Roots, Beloved, and Uncle Tom’s Cabin. Walker’s interruption of these familiar works , along with her generative use of the familiar in unexpected and destabilizing ways, reveals the extent to which genre-based narrative conventions depend on specific representations of race, especially when aligned with power and desire. Breaking these implicit rules makes them visible—and, in turn, highlights viewers’ reliance on them for narrative legibility. As this study reveals, Walker’s engagement with narrative continues beyond her early silhouette work as she moves into media such as film, video, and sculpture. Peabody also shows how Walker uses her tools and strategies to unsettle cultural histories abroad when she works outside the United States. These stories, Peabody reminds us, not only change the way people remember history but also shape the entertainment industry. Ultimately, Consuming Stories shifts the critical conversation away from the visual legacy of historical racism toward the present-day role of the entertainment industry—and its consumers—in processes of racialization. Rebecca Peabody is Head of Research Projects and Programs at the Getty Research Institute in Los Angeles. She is coeditor of Lawrence Alloway, Critic and Curator and Pacific Standard Time: Los Angeles Art, 1945–1980 and editor of Anglo-American Exchange in Postwar Sculpture,1945–1975. In addition, her essays have appeared in numerous exhibition catalogues, edited volumes, and journals.